It has been a while since our last interview with Perry Kaufman… So having recently the opportunity to interview the famous Ernie Chan, we could not miss it! 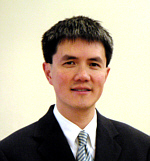 Ernie Chan is the Managing Member of QTS Capital Management LLC, a commodity pool operator and trading advisor. He is also the author of “Quantitative Trading: How to Build Your Own Algorithmic Trading Business” and “Algorithmic Trading: Winning Strategies and Their Rationale“, as well as the popular trading blog epchan.blogspot.com. Find out more about Ernie at www.epchan.com. Ernie, in case someone still ignores who you are, can you tell us a bit about yourself? I started out as a machine learning researcher at IBM, working mainly in text mining. Then I transitioned into finance by joining an internal consulting group in data mining at Morgan Stanley. After more than a decade working for investment banks and hedge funds as a quant, I decided to become an independent trader in 2006. Soon afterwards, I started to manage other people’s money as well. Along the way, I have written a trading blog and a number of books (“Quantitative Trading” and “Algorithmic Trading”), and have taught many seminars and courses around the world. Is your trading 100% systematic, or are you allowing you some discretionary interventions too? The only discretionary element is leverage determination and capital allocation among different strategies. This is a dynamic process, since new strategies are born and old strategies die all the time. Is all your trading chain fully automated? Yes. We trade only backtested models, In order to execute these models faithfully, the process must be automated. What is the place of the human in this loop? Research and monitoring. Software always has bugs, so it is important to have a human that can override it when bugs hit. What do you say to people thinking it is not possible to outperform the markets on the long run with automated strategies? Some of the most enduring, successful hedge funds are almost 100% algorithmic (e.g. Renaissance Technologies and D.E. Shaw). Also, some high frequency trading firms which have practically no losing days over many years are of course fully automated. I know you have been trading equities and futures but that you are now quite involved in Forex. Can you tell-us why? Are you trading spot? We trade only spot Forex. The most successful strategies in trading spot Forex are mostly technical/quantitative-based. There are few fundamental strategies that are applicable. This plays to our strength. Also, FX market is more liquid than either equities or futures markets, which we find conducive to automated executions. On top of all that, it has the lowest transaction costs. What are your thoughts about Forex microstructure? At Alpha Novae, we have a strong opinion against Last Look and lack of transparency on Forex market…What do you think about it? Does it impact your algorithmic trading? If yes, how? We currently only trade in FX markets that do not have last look. I agree with you on this: last look and the fragmented nature of FX markets are exploitative of buy-side traders. We had spent many months developing a strategy that backtested very well but fell apart in live trading due to last look, to our great frustration. Henceforth, we avoided those markets. Do you consider optimal execution important for your trading? If you do, how do you measure execution quality? Certainly. We measure our executions against a walk-forward test and see whether slippage is significant. Interestingly, we find that our executions often generate “negative slippage” since we run strategies that offer liquidity. Can you tell-us a bit about your live trading infrastructure ? Did you build-it in house? What are the most important part for you? Yes. My partner Roger is an experienced software entrepreneur. His products written in C# are sophisticated and well-polished. The main advantage of building in-house is of course that we know exactly the internal logic and can change it in any way we like. If you were looking to buy your trading infrastructure/platform, what would be your main criterias? Flexibility to accommodate any strategies that we dream up. Robustness against crashes especially during fast markets and financial stress. Anything is missing in the current offering? Flexibility is usually the main missing piece. Most automated execution software assumes a certain style of strategies, most commonly those that are directional and based on technical indicators. Few such software can accommodate arbitrage-based, portfolio-based, or relative value strategies. Similar question for the research/backtesting infrastructure. If you were looking to buy it, what would be your main criterias? Anything is missing in the current offering? In addition to flexibility, backtesting software need to be able to use level 2 quotes and has “fill simulations”. For institutional traders, top-of-book liquidity is often not sufficient. Our research team is of course churning out new strategies constantly. But personally, I am writing another book to complete a trilogy on quantitative trading. I am hoping to finish it in a year’s time. Ernie, many thanks for your time.